Discussion in 'Forum and Server Announcements' started by BiGUNMAN, Jun 14, 2017. 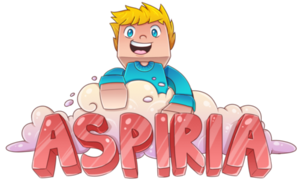 It's been five years since Aspiria MC's conception! Quite a crazy feat! To celebrate we're hosting a 20% sale off the whole store! The sale will end on the 21st of June, it will last a week. Thank you guys for supporting us for so long, and we hope you guys will continue to enjoy our precious server. There will be a global fishing contest happening this Sunday on the server at 10 AM, Pacific US Time! The server will be offline for a couple hours as we do a transfer tomorrow. We are also bringing in someone to solve the lag problem that seems to begin to occur when we hit around ~50 players mid-day. (The transfer has been complete). By the way Big, you forgot to remove the sign at the hub saying "UNDER MAINTENANCE". Glad minigames are up and running, its been a while since iv'e seen that. 10 am to you, 7 pm to me. I'll fish up a squid or two, ya'll see.